After nearly disappearing from most of the U.S., the bald eagle is now flourishing and no longer needs the protection of the Endangered Species Act. The nation’s symbol has recovered from an all-time low of 417 nesting pairs in 1963 to an estimated high of 9,789 breeding pairs today, and will be removed from the list of threatened and endangered species. To ensure that eagles continue to thrive, the U.S. 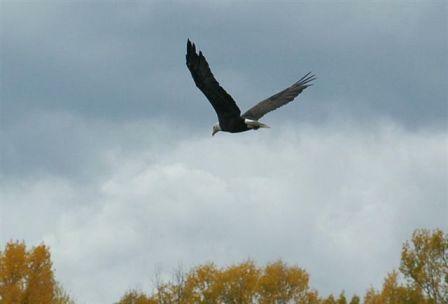 Fish and Wildlife Service will work with state wildlife agencies to monitor eagles for at least five years. If it appears that bald eagles again need the protection of the Endangered Species Act, the Service can propose to relist the species. The Service is also making the draft post-delisting monitoring plan available and is soliciting public comment for 90 days. There are two subspecies of bald eagles. The "southern" bald eagle, Haliaeetus leucocephalus, is found in the gulf states from Texas and Baja California across to South Carolina and Florida, south of 40 degrees north latitude. The "northern" bald eagle, Haliaeetus leucocephalus alascanus, is found north of 40 degrees north latitude across the entire continent. 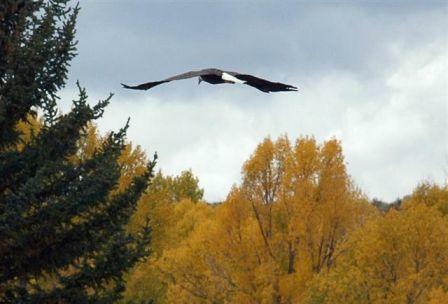 The largest number of northern bald eagles are in the Northwest, especially in Alaska. The bald eagle is the only eagle confined to North America, and there are no other large black birds in North America with white heads and tails. Size - The female bald eagle is 35 to 37 inches, slightly larger than the male. With a wingspan which varies from 79 to 90 inches. The male bald eagle has a body length from 30 to 34 inches. The wingspan ranges from 72 to 85 inches. Bald eagles weigh from ten to fourteen pounds. Northern birds are significantly larger than their southern relatives. Longevity - Wild bald eagles may live as long as thirty years, but the average lifespan is probably about fifteen to twenty years. A captive eagle at West Stephentown, NY lived to be at least 48 years old. Tolerance to cold temperatures - A bald eagle's skin is protected by feathers lined with down. The feet are cold resistance because they are mostly tendon. The outside of the bill is mostly nonliving material, with little blood supply. Eagles sit at the top of the food chain, making them more vulnerable to toxic chemicals in the environment, since each link in the food chain tends to concentrate chemicals from the lower. 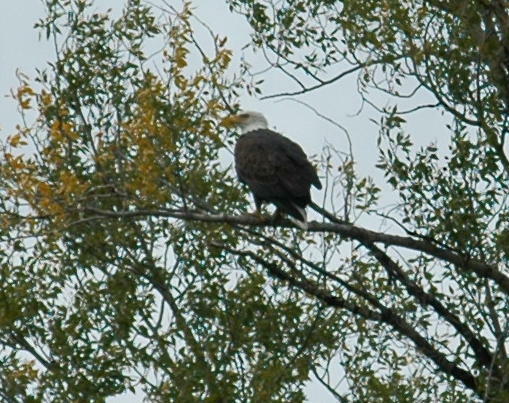 The "northern" bald eagle is slightly larger than the "southern" bald eagle. Studies have shown that "northern" bald eagles fly into the southern states and Mexico, and the "southern" bald eagles fly north into Canada. Because of these finding, the subspecies of "northern" and "southern" bald eagles has been discontinued in recent literature. Until 1995, the bald eagle had been listed as endangered under the Endangered Species Act in 43 of the 48 lower states, and listed as threatened in Wisconsin, Minnesota, Michigan, Washington and Oregon. In July of 1995, the US Fish and Wildlife Service upgraded the status of bald eagles in the lower 48 states to "threatened." (February 13, 2006) The bald eagle is closer to being delisted. The USFWS issued guidelines on how the bald eagle should be protected by landowners and others, once it's no longer safeguarded as a "threatened" species. There are proposals which prohibit disturbing the bald eagle, which include disruption of its breeding, feeding or sheltering practices, which could cause death, injury or nest abandonment. Officials said the action could lead to the removal of the bald eagle from the "threatened" species list within the next year or so. Even if the U.S. 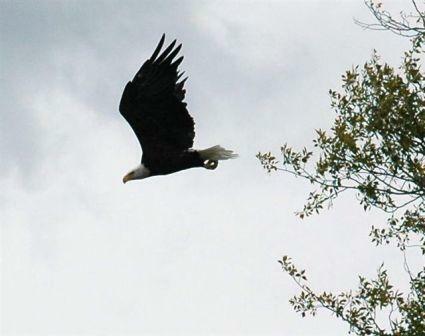 Fish and Wildlife Service removes the bald eagle from the "threatened" species list, it will still be protected by the Migratory Bird Treaty Act and the Bald and Golden Eagle Protection Act. The Bald Eagle Protection Act prohibits the take, transport, sale, barter, trade, import and export, and possession of eagles, making it illegal for anyone to collect eagles and eagle parts, nests, or eggs without a permit. Possession of a feather or other body parts of a bald eagle is a felony with a fine of up to $10,000 and/or imprisonment, although federally recognized Native Americans are able to possess these emblems which are traditional in their culture.